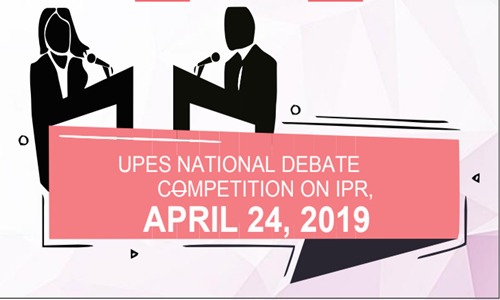 UPES University with a purpose School of Law in organizing UPES National Debate Competition on IPR to be held on 24.04.2019. Any UG/PG course pursuing student from any college/university. Rights as an inclusion mechanism. A total cash prize of ₹ 10, 000 for the winners. The registration amount is ₹100 only, per individual participant. Please register by 20 April 2019 to avoid last minute hassles. You will receive a registration confirmation mail from our dedicated mailbox upon successful completion. Last Date of registration: 20 April 2019. Last date of payment: 20 April 2019. Date of the event: 24th April 2019.